Piezoresistive sensor is semiconductor sensor made of silicon. The resistive material is on a thin silicon membrane which on Pressure changes shows the value. So two terminologies needs to be explained – first is Sensor. We have about the sensor in our previous article named Sensor in Technology and Nature. We are not going in to details of Sensor in this article on Piezoresistive sensor. The terminology Piezoresistive is derived from combination of two words – Piezo and Resistive. Piezo is a Greek word and stands for pressure. Piezoresistive sensor changes resistivity due to force on it. These sensors are also known as piezoresistors. With the development of telegraph in the 19th century, the problems of signal propagation and conductivity changes led to the observation of the change in conductivity or resistance under mechanical stress =. In 1856, the British physicist William Thomson, noticed for the first time, a change in electrical resistance with elongation of iron and copper. The same year, Lord Kelvin gave a lectureto the Royal Society of London, where he presented an experiment in which iron and copper wires were given weights and resistance change was measured with a Wheatstone bridge. Herbert Tomlinson confirmed the change in conductivity in the presence of mechanical stress. The term piezoelectricity, meanwhile, appeared much earlier with Hermann Hankel in 1881. Where V is the Poisson’s ratio of the material. 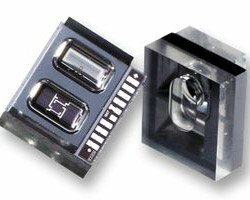 Even if the changes are relatively small, they allow the use of these sensors ( strain gauge ) over a wide range of applications. The piezoresistive effect can be used for the measurement of pressure and also humidity and gas concentrations. For example, when the membrane changes due to contact with moisture or gases in the volume and exerts pressure on the piezoresistor it can be measured by a Piezoresistive sensor. Piezoresistive sensor can also be developed from polymer layers that respond to pressure and change its shape or volume. Piezoresistive sensors are therefore suitable for a variety of applications including solid state accelerometers and bipolar transistors. This Article Has Been Shared 2890 Times! Organic Light Emitting Diode or OLED is a luminous thin film component made of organic semiconductor materials which differs from LED in various aspects. Transparent SATA HDD Casing is an extreme Mod. You be creative and do in the way you like with and Internal HDD and Kit for making it external USB storage. Cite this article as: Abhishek Ghosh, "Piezoresistive Sensor : How They Works," in The Customize Windows, February 14, 2013, April 21, 2019, https://thecustomizewindows.com/2013/02/piezoresistive-sensor-how-they-works/.